Labor Day (2013) Rated PG-13 | What to Watch. When I first heard about this film, I thought that it would be the overplayed story of two former flames coming back together. Instead, it’s the story of two emotionally wounded and scarred people who find each other. I’m not spoiling anything by saying that Josh Brolin plays an escaped convict on the run. The interweaving of Kate Winslet’s and Brolin’s characters through both their past and present circumstances reveals the depth of their pain, which slowly binds them together. Some may think the film is too slow, too gratuitous with the growing sense of intimacy between them, but I disagree. There is something about the slowness that drew me in and made me root them, despite their impossible circumstances. It’s one of those romances where you find yourself desperately hoping for the best. The young son, Henry, is not a forgotten character either. He makes problematic choices along the way, implicating his mother and their “guest” which threaten to alter the course of their future. Somehow, the film manages to result in the best possible outcome. 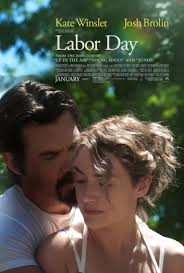 Rich, languid, and, at times, disturbing, Labor Day is worth a watch. This entry was posted in 2013, Drama, films, Movie reviews, movies, Rated PG-13, reviews and tagged Clark Gregg, film, film reviews, filmmaers, films, Gattlin Griffith, heart, j.k. simmons, James Van Der Beek, Josh Brolin, Kate Winslet, Labor day, Labor day weekend, lives, man, movie, movie reviews, movies, past, people, present, problems, romances, single mom, son, stories, story, Tobey Maguire, trailer, two, worth, young. Bookmark the permalink.